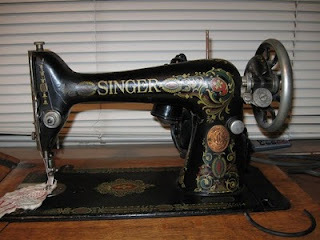 While visiting my Mother-in-law, I asked her if I could take a look at the Singer machine that she wants me to have. 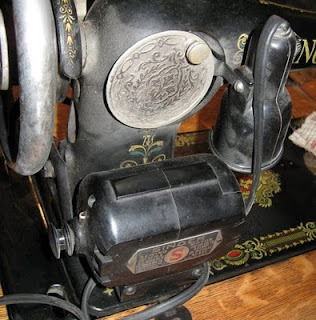 This machine belonged to her grandmother and she remembers her mom using it. She uses it as a side table now but would love for me to take it so she could buy more bookcases. 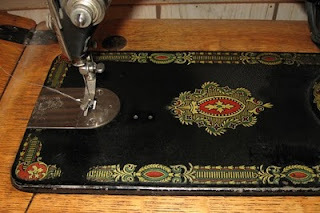 Wouldn't it be a great addition to my sewing studio whenever my partner and I get it started? I was so excited to see that it was a red-eye! 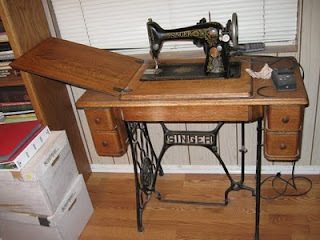 Unfortunately, it no longer has it's treadle pedal or belt wheel. Her mother had it motorized. Does anyone know if I could just replace those parts or do I have to find a whole new base? I'm sure it will be much easier to use with the motor, but I would love to have had it in its original condition. I do really love that it has a light. The machine is in pretty good shape and it still works. At least the hand wheel turned by hand for me. I didn't plug it in to try it. I'm sure all the oil will need to be replaced. As for how old it is, I'm having a hard time figuring it out. It looks to me like the serial number above reads 760331. I didn't look at it closely when I was with the machine in person, unfortunately. I don't see a decimal point in the picture, but it is a bit fuzzy. 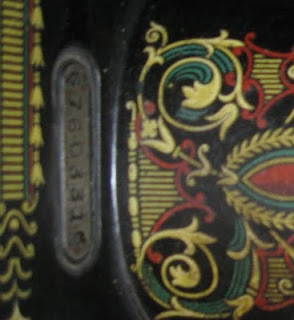 According the Singer website, that would date the machine to 1871. However by my research, the Red Eye decals weren't being used until 1910. So my dear friends, can you help me figure out the correct date? I thought the G was a screw hole to secure the serial number plate to the machine. It's not a screw hole - it's a G. The serial # is G7603316, which puts the date as Dec 24, 1919, and makes it a Model 66 - which is correct. The date is the date the serial numbers were issued, not necessarily the actual date it was made. It's about 3 years newer than my Red Eye 66. The belt is extremely easy to find and replace. The pedal - I don't know, but I'm sure they're available and once you really start looking, you won't have to wait too long to find one. These aren't rare machines, even today, and finding parts on Ebay or Craigslist or elsewhere is not difficult. How come you didn't bring it home? Oops ... just saw that you said (and it's missing) the belt *wheel*. Still, even whole new treadle hardware won't cost a fortune. You don't need the cabinet, just the metal parts. There are Yahoo and other groups that can point you in the right direction for those parts. It's in nice condition and doesn't look like it will need a lot of cleaning up. That's a great looking machine. I have my mother's old Singer. Maybe I'll finally get it running again in 2010. Pretty! The only parts that are *not* easily replaced are the decals and the back-clamp presser feet. Once the decals have been "cleaned" they are gone. There are often parts on ebay from machines that are being parted out, as well as some excellent groups for restoring sewing machines. One is treadleon, and a yahoo group called wefixit (?). I don't have the URLs, they seem to be on my computer at work. I'm fairly sure other sources have been mentioned on pattern review and stitchers guild as well.